Design Sets The Mood for Your Event | LunaGraphica, Inc.
We create a lot of event posters and flyers at LunaGraphica, and we do it for a surprising variety of clients. It is always exciting to help our clients set the tone for these events through the design work we do for them. Some come to us knowing exactly what mood they want to set for their event, and some end up letting their design vision help them focus the tone for what they are planning. Either way, it is always interesting to see how designs develop and begin to tell a story about the events they are advertising through the process of working with our clients to best represent their needs and desires. When Verde Vineyards approached us about creating an advertisement for their upcoming seafood boil we knew our design team would have to focus on showing people this would be an elegant event. Many people might hear “Crab & Shrimp/Clam Boil” and automatically think about those restaurants where they dump a pot of boiled seafood, corn on the cob, and potatoes on a newspaper covered table in what can only be called a “sea food free for all”. This is not the mood our client wanted to convey and we worked hard with Verde Vineyards to ensure this event would be properly represented by our design work. Senior Designer Jennifer Meyer took special care in fine-tuning this project, and as usual, provided our clients with an exquisite finished product for their event. Let’s have a look at the components of this design to see how each speaks to the desired tone of this event and how they all work together to tell the vineyard’s target audience what to expect from the evening. This is a late-spring, evening event at the vineyard and the color scheme works very well to convey a feeling of a warm, pleasant evening in Gilroy. The shades of gold and red hint of a West Coast sunset enjoyed over delicious foods and wines, with a warm evening breeze welcoming friends to celebrate the finer things in life together. Had the shades of these colors been brighter or lighter, they would have been more representative of a daylight event. Since this is an adult occasion we would also run into the probability of creating a design that looked too juvenile if we had we utilized shades and colors more traditionally associated with springtime. The colors chosen expertly combine to create a sophisticated mood that maintains brand consistency, and advertises an enjoyable adult evening filled food, music, and wine. The wrong choice in fonts could completely destroy even the most stunningly appropriate color scheme. This design uses an easy to read, yet artistic serif font to keep the design feeling classy, but easy to read. It is important that viewers are able to read the details for events like this. Using a script or overly decorative font could mean guests misread event details. In keeping with the tone set by the color pallet, a pretty script font is used for the headline only. This gives the design the swankier feeling expected of a high-end event and pairs will with the serif font used to give the necessary information. It is very easy to confuse your message when pairing fonts and utilizing text size to highlight important information and lead the viewer from one line to the next. Viewers will more than likely never notice their eye is being pulled downward as they view the poster, and that is exactly how it should be. It takes a special finesse to pull this off, and by almost stair stepping the fonts used here from larger to smaller our eyes just naturally start at the top, and smoothly transition downward, taking in all of the information provided as if we are having a conversation with the design. When all the elements of a design work together it creates a powerful piece of marketing. In taking a final look at this poster we see how the graphic imagery used ties the whole poster together. This goes beyond the use of event specific imagery… notice how the placement of each element holds our gaze toward the center of the flyer. We don’t have to spend time figuring out where we should be looking; our eyes are pulled there. The artwork isn’t just beautifully representing the subject of the event being advertised, it works in tandem with every design element to give the poster a calming fluidity. Imagine what this would look like were the imagery scattered about the poster at random, or bunched heavily at one end or the other. Your eyes wouldn’t know where to go first! Sometimes design like this works for the event. If our design team were creating a poster or flyer for a wild club party (which we often do), the client might want the work to represent an exciting night filled with dancing and raucous celebration. In that case, this design wouldn’t work at all. 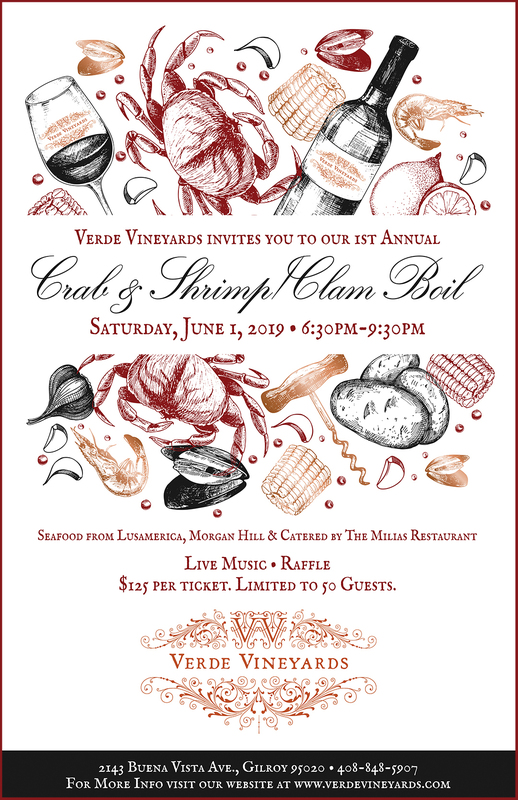 But because our design team kept the event and the appropriate mood in mind, we were able to give Verde Vineyards something that not only advertises their upcoming Crab & Shrimp/Clam Boil, but also tells people what kind of event this will be in many unspoken ways. Need Help Setting The Mood For Your Next Event? Our design team loves the challenge event flyers and posters provide! We work hard to make sure the design we bring you speaks to your business and event in the way you need. Contact us today and tell us how we can help make your next event a success!